Linda Thiemann is an award-winning contemporary fiber artist, who produces fashion, wearable art, wall hangings, and sculptural pieces. Her fine art focuses on felted and fiber mixed media pieces, while her fashion is a mixture of felting, sewing, and layering. Her striking use of colors and reliance on texture is prevalent in virtually all of her work, and the influence of nature comes through even in much of her fashion. Lindas fiber art is completely handmade with attention to every detail. She selects as many of her quality materials as possible from local fiber farmers or other small local businesses. Each finished creation has been lovingly crafted and proudly produced in the Dallas/Ft Worth area. Elegant and fashionable shawl made from cut strips of silks, shears, and other fancy fabrics. The strips were sewn flat onto garment, then many were turned perpendicular to base and frayed, creating a wonderful textured effect. 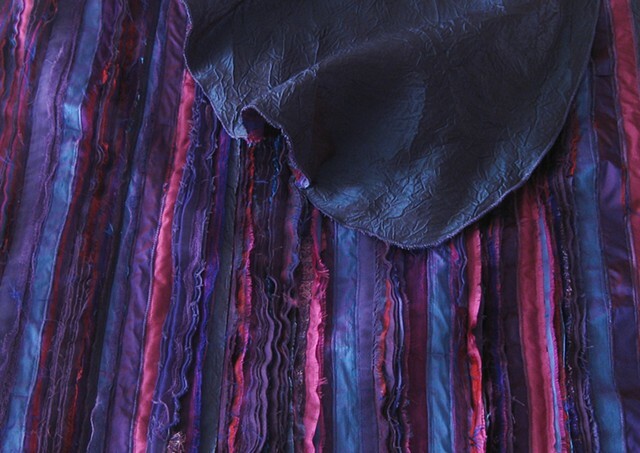 Lovely iridescent crinkled silk lining allows for a fully reversible garment.